Ladies & Gentleman, Friends & Family, Blog Readers, Facebook friends, it’s official: there’s a new man in my life. He’s everything I ever dreamed of. Photogenic, forgiving, always there and always up for a good time out on the town. But…going in, I should tell you, it’s temporary. I left him behind yesterday and he patiently waited for me right where I left him. He didn’t care. He knew I’d be back for him. I dare say, he’s the best boyfriend ever so far!!!! My new best friend and great to have around for my adventures in NYC this week while I’m here “for work.” He loves that he even gets to go on business trips with Do More with LES! He’s a fun colorful guy who is “just my size” and fits in my purse. He must get folded and stored in a Ziploc bag, but he travels nicely. Doesn’t come with much “baggage” if you will! 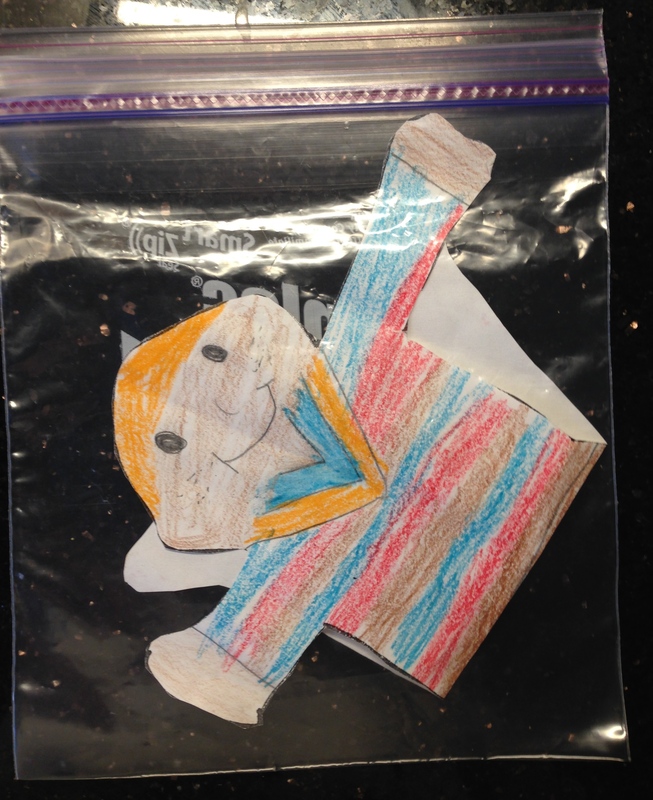 You see, Flat Stanley belongs to a student, Maggie, in Mrs. G’s classroom at a school in Massachusetts. (That student’s name has been changed for internet-safety purposes.) 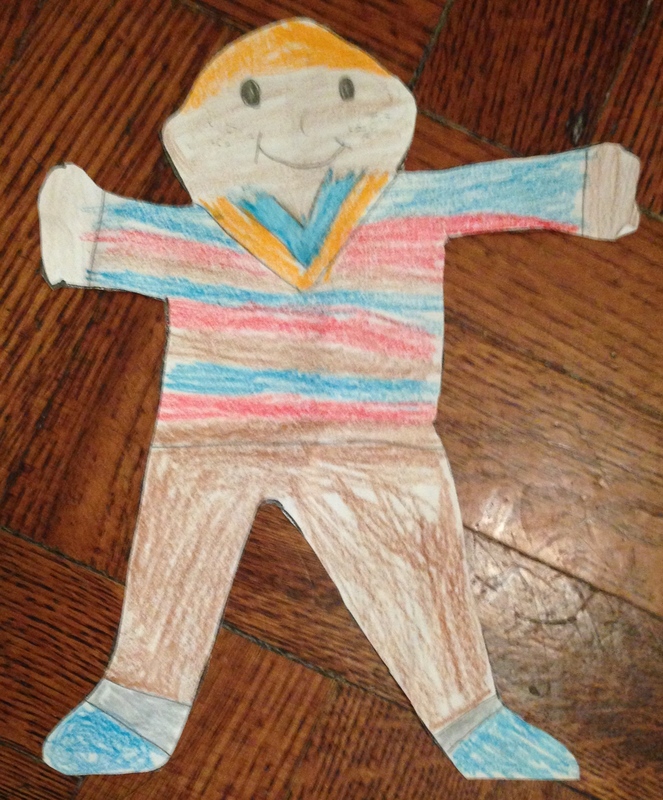 Maggie colored and cut out Flat Stanley and made him her very own. He can dress, too, another perk! He’s sporting a v-neck sweater, which I think sometimes looks like a ribbon holding what could be a gold medal. (We’re so ready for Sochi!) He’s an award-winner all right and a very good sport! Stanley on the Bolt Bus to NYC! Live From New York, It’s…. FLAT STANLEY! Stanley watching the ice skating at Rockefeller Plaza Ice Rink! Here comes the 5 Train! There goes a 4 Train! Hold on tight on the subway, Stanley! Stanley on the Brooklyn Bridge! Stanley at the Swatch store on Madison Ave! Room Keys at the Library Hotel are in card catalog drawers. Stanley in the snow with the iconic lions! Yummy! Pancakes, coffee & OJ at a NYC diner! « A Snow White Week in New York City!